People here seem to never sleep. This is a small area of a few square kilometers in the heart of District 1, Ho Chi Minh City, is filled with a ‘backpack’ abroad. 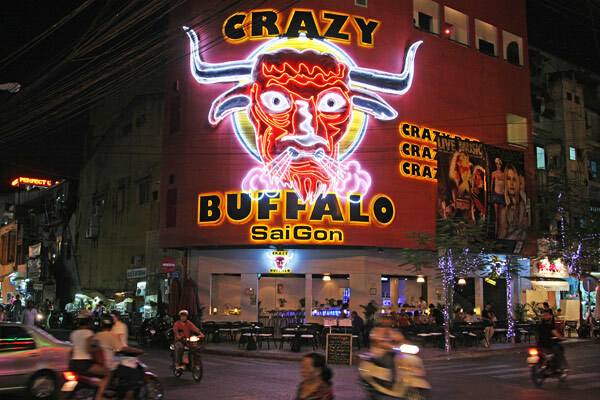 Locals call it the “Khu pho Tay Balo” or ‘Saigon Backpackers’ – a hot spot for foreign tourists to stay in Vietnam. It’s becoming more and more well-known around the world as the “city” of motels, restaurants and an abundance of other services for travelers belongs to the low prices. This area is surrounded by the streets of Pham Ngu Lao, De Tham, Bui Vien and Do Quang Dau. It is crisscrossed by plenty of small alleys linking the two ends of the region to form a “maze”. With its small size, backpackers have to spend at less an hour walking around the ‘maze’. The streets and alleys here are home to more than 90 tourist offices, 247 hotels and motels, 72 certified restaurants set up dining tables along the sidewalk, and 25 fashion and gift stores. Foreign backpackers are seen walking around, eating or drinking at any time, day or night, in the “city”. One of the “specialties” when visiting this region is the language – English, French, Spanish and Japanese. But the most fascinating language, which was not really named of the “street”, is a mixture between body language, Vietnamese and foreign languages given in a conversation. Unlike alleys in other areas, alleys in the city ‘Backpackers street are busy from midnight until the early morning, because this is part of the day when the international flights come cheaper in Sai Gơn. 104 alley on Bui Vien street, which is less than 1.5m wide and 200m long, has more than 20 mini hotels which stand together. Neon signs of hotels and other services alley light up all night make the colorful alley. “I have been here for a month, I really like it. It’s friendly, I think it is easy to live in Vietnam,” a woman said. At another table, some backpackers are using their smart phone, checking Facebook at 3:00 am – four hours before the starting day. Not only rooms are available, as tourists can choose cheaper dorm rooms – a room of nine square meters for a maximum of six people. It has three bunk beds. 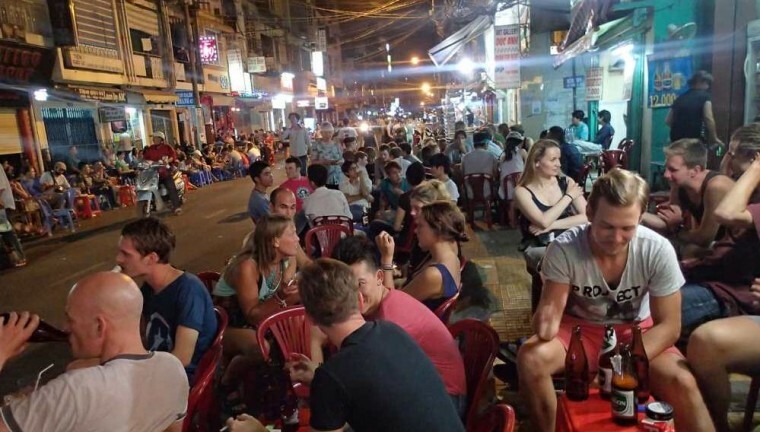 De Tham, Pham Ngu Lao Streets are the ‘domain’ of the tourism office and car reservations, while Bui Vien is mainly for hotels and restaurants, and Do Quang Dau is the street of bars, coffee and night street foods. At the bar, guests can listen to music not only international but also watch the football matches from the English Premier League, La Liga, Bundesliga and Champions League. Guests can also enjoin other services such as tattoos and massage salon, and spa at the intersection of Bui Vien and Do Quang Dau. The corner is full of tobacco smoke and women staying up late. Most foreign tourists staying at the Saigon Town Backpackers dress like the local people do while walking along the street – a T-shirt, shorts and slippers. They greet each other as friends. Some people use chopsticks to eat. They drink coffee in Vietnam, which is different from other places in the world, because it is mixed in boiling water to make a thick black liquid after passing through a filter. 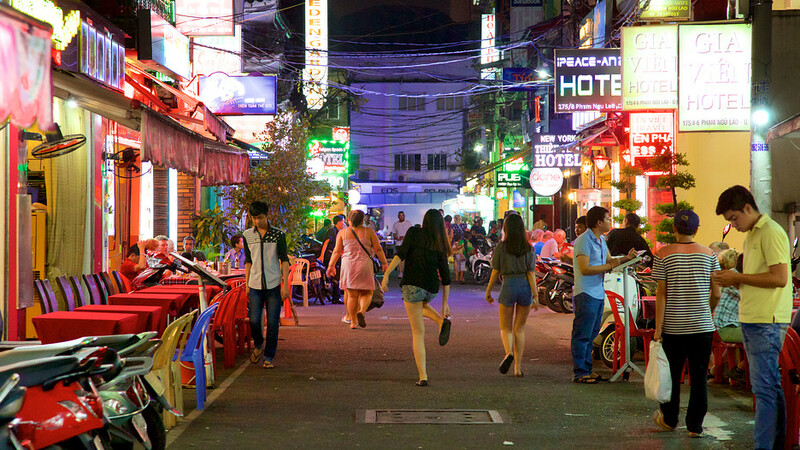 Most visitors stay in ‘backpackers’ street for several days, and it serves as a place of transit for foreign travelers before departure for other areas such as the Mekong Delta, Nha Trang, Da Lat, or flying to neighboring countries such as Cambodia and Laos. On average, the hotels’ prices in the region is US $ 12 -22 per day, but can be lowered to $ 7 pair. High season for the Westerner is from August to January, while Asian guests often come in February-April.